A month has passed since I returned from Seoul, and time has flown, so a review of Zandari Festa is more than overdue. With over one hundred and fifty acts on offer across Hongdae over the three-day weekend I, alongside Jeong Eun, began with a plan of who we knew we wanted to see at Zandari, but as the saying goes the best-laid plans of mice and men often go awry and our timetable was met with the occasional change. Here are the highlights of our Zandari adventure. Blue Turtle Land was a definite highlight of Zandari’s first day. 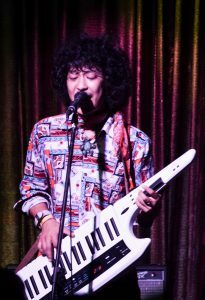 At first, the performance felt jarring, vocalist and keytar player An Hong dresses exactly like Jimi Hendrix and initially I couldn’t understand the need to. Their music is, unsurprisingly, inspired by the psychedelic movement and artists such as Hendrix, though is distinct and not wholly derivative. I left their show appreciating their music, though confused about their visual. On day three I met An Hong by chance, many hours after his performance at Club Steel Face, and he still wore his Hendrix-esque clothing. It was then I realised that his style may be of a different era but it certainly isn’t a gimmick. …Whatever That Means provided us with our first dose of punk at Zandari. …WTM are loud and fast-paced, and full of energy. Their music feels reminiscent of the angsty soundtrack to my teenage years, and over a decade later still the sound is a go-to favourite. British Night showed off an impressive selection of British talent, with She Drew The Gun quickly becoming a favourite. 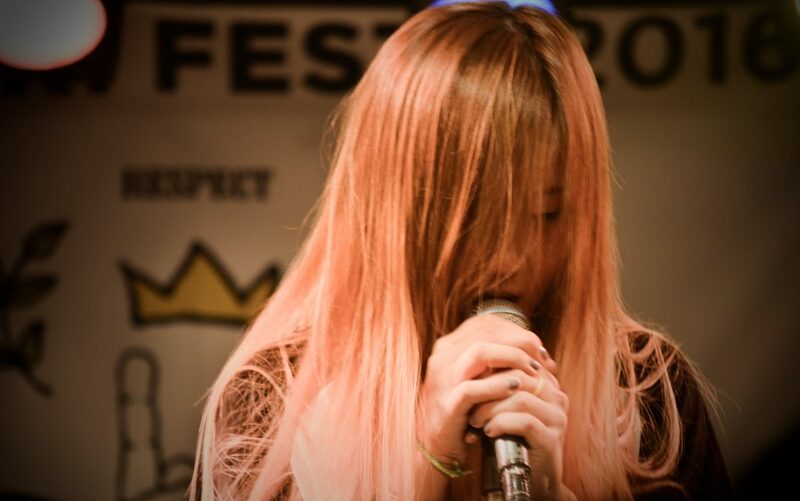 Busan-based group Unchained formed in 2001 and aims to capture the Seattle grunge sound. The band had arrived in Seoul just in time for their set, though there was no sign the group was lacking preparation for their Zandari performance. Unchained’s vocalist Kim Kwang-il at times is reminiscent of System of A Down’s Serj Tankian, or Soundgarden’s Chris Cornell – a comparison the group would possibly appreciate, given they cite the latter group as an inspiration. Jeong Se-woong plays the drums with a little American rock stereotype thrown in for good measure. There’s something of Travis Barker (Blink 182) about him as he plays the drums shirtless, his torso and arms covered completely in tattoo ink. Given the Famous Stars & Straps logo (Barker’s apparel label) on his chest, the image is likely intentional. There is a passionate and raw nature to the music of Unchained. Kim’s is a voice you will long remember; and teamed with the skilled grunge stylings of guitarist Kim Ji-guen, bassist Ham Jin-U, and Jeong, Unchained are bound to impress any fan of the grunge scene. Day two saw rain hit Seoul meaning both Kangol Acoustic and Steel Face Rooftop artists relocated to the artist lounge at Smoke 16 coffee shop. Smoke 16, therefore, became the first stop of the day to see reggae artist Tehiun. Tehiun mixes Jamaican reggae rhythms and traditional Korean melodies to deliver a solid reggae style with a subtle twist. His acoustic set brightened the rain-soaked atmosphere that began the day, and as Tehiun performed tracks expressing his love for his analog lifestyle the relaxed setting felt perfect. Southway filled Club FF with colour, both visually and musically. Southway has a definite knack for making their audience smile. Both Shiun and Shaun have excesses of energy and their stage presence has you hooked. Just as Bowie seemed to channel the sounds of the future so do Southway, their live show feeling like a journey into the unknown. Despite having seen LayBricks three times during their UK tour earlier this year we couldn’t resist stopping by to see them play Zandari Festa. Already a firm favourite LayBricks wowed us further, their performance to a home audience packed with even more life and spirit. Look and Listen too were relocated to the artist lounge due to rain closing Steel Face Rooftop. This co-ed trio could be easy to overlook initially. Their music is simple, though this isn’t uncommon among the punk and pop-punk genres. Though take a moment to ‘look and listen’ and you’re soon drawn into their catchy sound. Performing as a three-piece due to the military enlistment of Noh Soon-kyu, The Veggers impressed instantly. 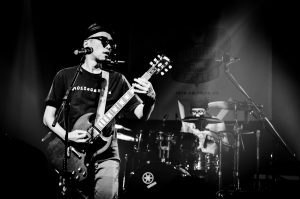 Their Zandari Festa appearance was set to be one of their last performances as a group before mandatory enlistment took them down to just two members – and they certainly made it count. The Veggers are loud and unruly. They show off and play up to stereotypes of their punk predecessors – and the audience eat it up. Baking under stage lights in leather jackets, showboating guitar playing, even hurling guitars across the stage – there’s something of the Californian rebirth of punk about The Veggers. The trio was even joined on stage by Korean punk veteran Insoo Kim of Crying Nut much to the excitement of the audience. We decided the best way to end our Zandari experience was with an old favourite – meaning we headed off to see PATiENTS, accompanied by our good friends Tirikilatops (who’s Zandari set had them perfectly at home in the cave-like setting of Club Freebird). What can we say about PATiENTS that we haven’t already said? Having seen the group on three continuous UK tours it has been interesting to see their sound and stage presence grow; seeing them play in South Korea only furthered our appreciation. Ego Function Error embody everything that is important about indie. Formed of vocalist Kim Min-jeong, guitarist Kim Young-gwang, bass player Lee Seung-hyeon, and drummer Kwak Won-ji, Ego Function Error describe themselves as a psychedelic girl-funk rock band. There’s plenty of ‘Girl Power’ on show from Ego, even with a male member. 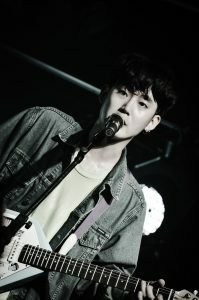 Guitarist Kim Young-gwang ‘really likes pretty things and has a desire to be beautiful.’ At first sight, it’s easy to assume Kim as female, on stage Kim unashamedly expresses himself fully as a crossdresser, wearing tiny denim jean shorts and tights it is only as he takes his shirt off one is reminded of his physical gender. The gender fluidity of Kim and that it is a complete non-issue is a first class advert of the acceptance one finds in indie music circles. As for their music, Ego Function Error are loud and energetic, and full of punk rock attitude. With their infectious sound, their couldn’t-care-less attitude, their beautiful visuals you will be completely absorbed in the performance of Ego Function Error. The festival too boasted an impressive after party, though I spent most of the night talking with old friends and making new ones – a highlight of the festival in itself. Though I did see five minutes of Colonel Mustard & The Dijon Five. They are eccentric and almost impossible to put in a genre-shaped box. But ultimately they are fun, and definitely the best choice to end the festival on high spirits. Zandari Festa is an impressive showcase festival that makes me miss the old format of Liverpool Sound City, a festival that outgrew the barhopping layout. It is inclusive, accepting, and unafraid to dare to be different. I am extremely grateful to Zandari for allowing me to cover their 2016 festival, and for the welcoming nature of all those involved.Given the means and opportunity, Zandari is a music festival I would love to visit year after year. These, however, weren’t the only indie bands I saw in Seoul. Stay tuned for more gig coverage.